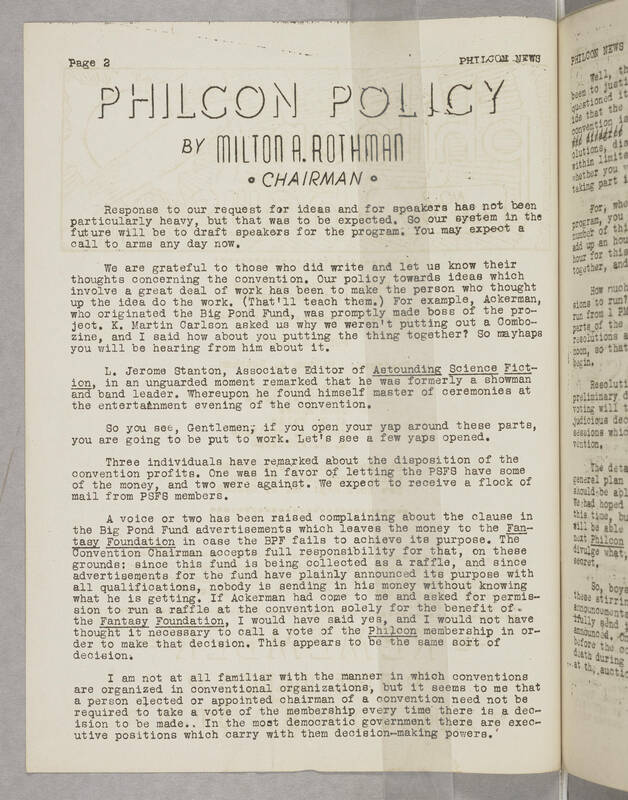 Page 2 PHILCON NEWS PHILCON POLICIES BY MILTON A. ROTHMAN CHAIRMAN Response to our request for ideas and for speakers has not been particularly heavy, but that was to be expected. So our system in the future will be to draft speakers for the program. You may expect a call to arms any day now. We are grateful to those who did write and let us know their thoughts concerning the convention. Our policy towards ideas which involve a great deal of work has been to make the person who thought up the idea do the work. (That'll teach them.) For example, Ackerman, who originated the Big Pond Fund, was promptly made boss of the project. K. Martin Carlson asked us why wo weren't putting out a Combozine, and I said how about you putting the thing together? So mayhaps you will be hearing from him about it. L. Jerome Stanton, Associate Editor of Astounding Science Fiction, in an unguarded moment remarked that he was formerly a showman and band leader. Whereupon he found himself master of ceremonies at the entertainment evening of the convention. So you see, Gentlemen, if you open your yap around these parts, you are going to be put to work. Let's see a few yaps opened. Three individuals have remarked about the disposition of the convention profits. One was in favor of letting the PSFS have some of the money, and two were against. We expect to receive a flock of mail from PSFS members. A voice or two has been raised complaining about the clause in the Big Pond Fund advertisements which leaves the money to the Fantasy Foundation in case the BPF fails to achieve its purpose. The Convention Chairman accepts full responsibility for that, on these grounds: since this fund is being collected as a raffle, and since advertisements for the fund have plainly announced its purpose with all qualifications, nobody is sending in his money without knowing what he is getting. If Ackerman had come to me and asked for permission to run a raffle at the convention solely for the benefit of the Fantasy Foundation. I would have said yea, and I would not have thought it necessary to call a vote of the Philcon membership in order to make that decision. This appears to be the same sort of decision. I am not at all familiar with the manner in which conventions are organized in conventional organizations, but it seems to me that a person elected or appointed chairman of a convention need not be required to take a vote of the membership every time there is a decision to be made.. In the most democratic government there are executive positions which carry with them decision-making powers.